The Klasen family brought home 2 silver trophies, 7 gold trophies, and two first place overall age group trophies at the Showstoppers Regional Dance Competition. Sean, 10 and Savannah, 9, of Sonoita, brought down the house with the traditional Mexican dance â€œLa Negraâ€. As part of the large recreational 9-12 year old folkloric group, they not only won their age in the folkloric category, but also took first place over all categories for the age group. Mom, Suzanne, took the overall 16 and older with her gold first place in recreational song and dance. Sean and Savannah also received a gold first place in the 10 year old Folkloric duet for their duet to â€œEl Jarabe Tapatioâ€ and a silver award in the for their Hip Hop performance with the teen super group. Savannah, also, received gold trophies for her Polynesian folkloric group, lyrical group and tap group. In the final performance for the family, Suzanne also received a gold for her small group folkloric performance to the traditional version of â€œLa Bambaâ€. 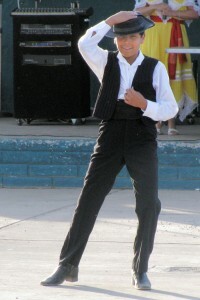 Sean commented â€œWinning overall for â€˜La Negraâ€™ was the most exciting part of the competitionâ€. Savannah said â€œI had the most fun in her hip hop performance because it was the most difficult and the most fun danceâ€. Sean and Savannah actually received their highest score for the whole competition for the group hip hop number, but it only earned a silver trophy because of harder scoring requirements in the teen age group. Age is determined in the Showstoppers competition by averaging the ages of all the dancers in a particular dance. 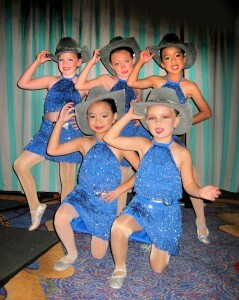 The Klasens hope to improve their scores at the Showstoppers National Finals at the Disneyland Resort, Anaheim, in July. How wonderful! We are so proud of you! With more the judges’ critiques and more practice, I know the scores will even be higher at Nationals. Looks like a lot of great medals……way to go!